It was all smiles on the first day of school, marking the 20th anniversary of linguistic boards. 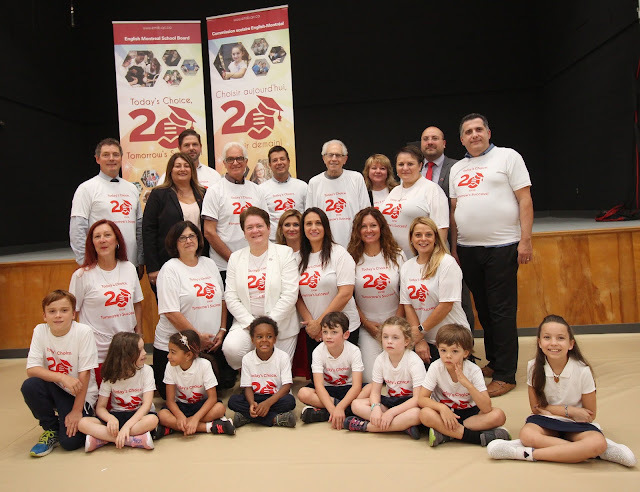 CELEBRATING 20 YEARS: The EMSB formally marked the 20th anniversary of linguistic school boards in Quebec on the first day of classes for the 2018-19 academic year on August 28 at Pierre Elliott Trudeau Elementary School (6855 Cartier) in Rosemount. The latter has thriving robotics and STEAM programs. It was originally known as Francesca Cabrini Elementary School, but encountered a name change to honour the former Prime Minister of Canada. Rebekka The Robot was among those wearing a special 20th anniversary t-shirt. Angela Mancini greets students at Pierre Elliott Trudeau. 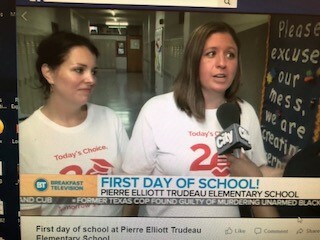 MEDIA COVERAGE: Here are links to some of the media coverage related to day one of school at the EMSB. Jessica O"Meara left with colleague Jennifer Lacroix. ORIGINAL GRADS: There are a number of individuals who were part of the very first graduating class of the EMSB in 1998-99 who are now part of the teaching faculty. Among those is Jessica O’Meara, a resource teacher at Pierre Elliott Trudeau School. She attended Francesca Cabrini Elementary School as a child before moving on to Vincent Massey Collegiate and later McGill where she got her degree in inclusive education. To teach at the very same school she attended is a very special experience. EMSB EXPRESS: The fall edition of the EMSB Express Newspaper has been published. There are special sections on the 20th anniversary, our 2018 Parent Vounteer Appreciation evening and a focus on James Lyng High School. Matthew Guy, a physical education and health teacher at Parkdale Elementary School in St. Laurent, is also an original grad. His two sons attend Edward Murphy Elementary School in Hochelaga Maisonneuve and he is featured on page 1 of the Express. Here is the link. 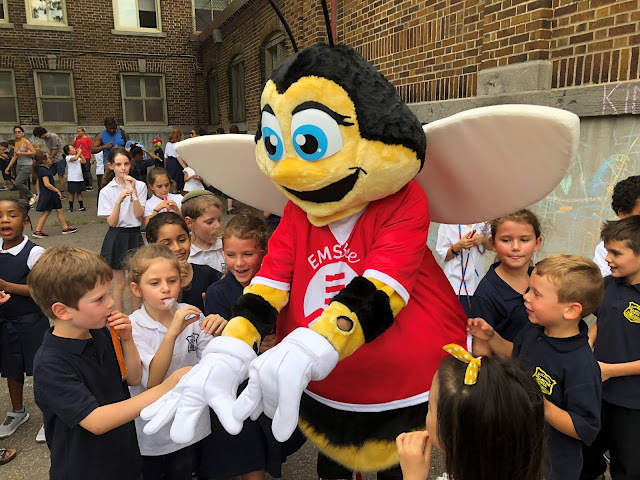 The EMS Bee was a huge hit on the first day of school. OUR MASCOT: The EMSB is proud to introduce the EMS Bee, the Board’s first ever mascot called Bumble. She will be making the rounds of schools and special events throughout the year, having made her debut on opening day. YOUPPI: Montreal Canadiens mascot Youppi! visited Elizabeth Ballantyne Elementary School on the first day of class and came face to face with Bumble. WEBSITE AND MORE: A new EMSB website will be unveiled soon, with facelifts for individual school pages to come. All major events, such as the Career Fair, Volunteer Appreciation Evening and the annual Parent Conference, will have 20th anniversary themes attached. Schools and centres will get on board as well. “As we mark the 20th anniversary since the Quebec government recreated public school boards along linguistic, rather than religious, lines I believe everyone associated with the English Montreal School Board has much to be proud of,” says EMSB Chair Angela Mancini. Beginning with our flagship site, emsb.qc.ca, we will be moving our elementary and secondary school sites onto the same platform over the next 12 to 24 months. Among the many exciting changes we plan to unveil, new sites will feature modern and responsive designs for desktop and mobile devices, board-wide emergency notification and the capability to share information easily between sites. With a website network that functions as a collective, we can more easily encourage collaboration and share information with our educational partners such as parents, municipalities, universities, LEARN/CLCs, MEES, and local youth-organizations. To remain leaders in public education, our commitment to new technology applies not only to our students in the classroom, but to our entire community as well. EMSB HISTORY: On July 1, 1998 the English sectors of the former Protestant School Board of Greater Montreal, the Montreal Catholic School Commission, the Commission scolaire Jérôme-Le Royer and the Commission scolaire Sainte-Croix merged to form the EMSB. At the time, the newly-formed board had more than 25,000 students in the youth sector and 12,000 on the adult side. Two years later enrolment at the primary and secondary levels rose past 27,000. Soon after, the Quebec government adopted legislation strengthening Bill 101. That development, along with demographics and a lower birthrate led to a steady decline in our student population. “But recently, we have happily seen a turnaround where that is concerned,” said Ms. Mancini. “We now have 19,561 students at the elementary and high school levels, a 267 jump from last year. When our 2018-2019 totals come in later this fall we expect the numbers to further improve. As for Adult Education and Vocational Services, there are more than 23,000 students registered – so nearly double the amount from when we were first established. With over 42,000 students in total, we remain the largest English public school board in the province. TRANSITION TO HIGH SCHOOL DAY IN ROSEMOUNT: In order to ease the transition to high school, on Monday, August 27 Rosemount High School welcomed its incoming Grade 7 students with an Amazing Race team building challenge and various other special activities. 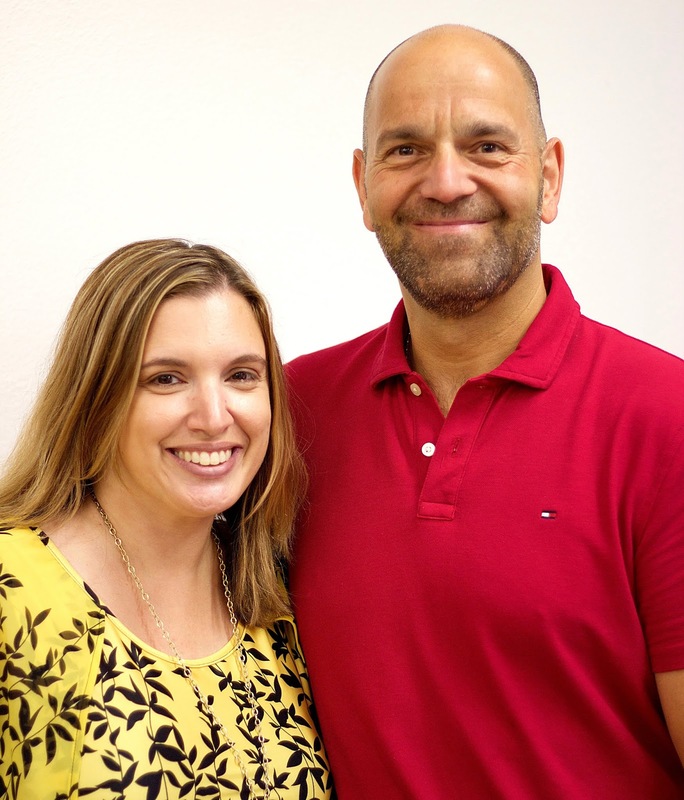 The unique program was facilitated by the Administration, Spiritual and Community Animator Vince Lacroce and Guidance Counsellor Britt Dash. Several senior Rosemount High School students were on hand as well. As starting high school is an intimidating time, the day gave new students the opportunity to discover their new surroundings without the business of a regular school day. Activities also helped foster openness, compassion and unity by providing students with the opportunity to bond with their new peers on problem-solving and team building challenges while discovering the different facilities and resources at the school. Building on this foundation, on the first day of school, these students participated in respecting diversity workshops that will help them understand how they are all unique with various strengths and weaknesses, but ultimately, are better together. 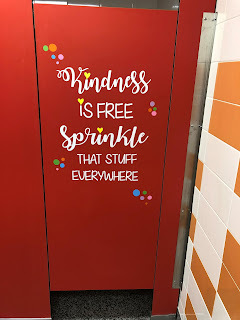 WASHROOM BEAUTIFICATION WITH QUOTES: Three washrooms at Rosemount High School have been given some neat art work done free of charge by Valerie Rouleau and her company called “Creation Filles des Bois.” Principal Marco Gagliardi said: "We hope it helps make our students lives a little more positive. Our personal posts have been shared over 42 times and we will share it through the school account." CAREER FAIR: The 2018 EMSB Career Fair will take place on October 17 and 18 at the St. Pius X Vocational Centre in Ahuntsic. An Open House for parents and their children in Grades 10 and 11 will take place on October 17 from 6 pm to 8 pm. This is a one stop shop for CEGEP and vocational centre options. Junior Chorale (Gr. 4-5-6): Saturdays from 10:45 a.m. to 12:15 p.m.; Senior Chorale (High School/treble voices): Saturdays from 9:00 to 10:30 a.m. and Tuesdays from 7:30 to 9:00 p.m.
For more information and/or an audition call Ms. Abbott at (514) 483-7200, ext. 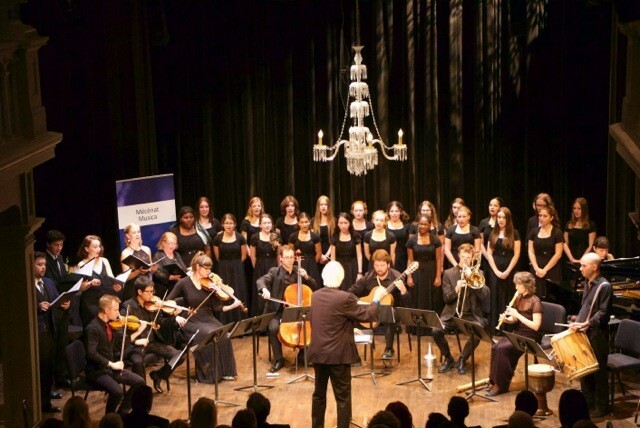 7234 – E-mail: pabbott@emsb.qc.ca/ Students may audition either at an audition session in their own school or by coming to Westmount Park School on any Saturday morning in September as of September 8. Rocco Speranza with some veterans. 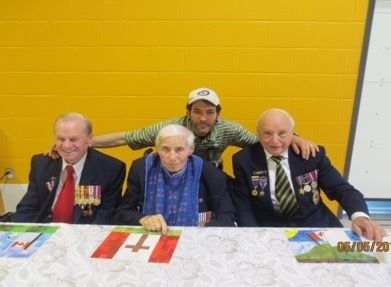 SPERANZA’S WALK: For 16 consecutive days this summer, EMSB Spiritual and Community Animator Rocco Speranza walked over 300 kilometers through a very hot and humid Montreal to mark World War II’s Operation Husky and The Italian Campaign. See the full summary here. School in St. Leonard (previously a teacher at the school); Laura Fiumidinisi Marymount Academy International in NDG (previously a teacher at Rosemount High School); Christy Tannous, Royal West Academy in Montreal West (previously a vp at Pierre de Coubertin Elementary School in St. Leonard); Vince Timpano, Vincent Massey Collegiate (previously vp at FACE downtown); Matthew Shapiro, Westmount High (previously a teacher at Focus School); Cornelia Mandoiv, Westmount High (previously a teacher at Willingdon); Saverio Servello, Royal Vale (previously vp at Rosemount Technology Centre); Ivan Spilak, Leonardo Da Vinci Academy (previously a teacher at Vincent Massey Collegiate); Amanda Vallelunga, Michelangelo International (previously vp at Westmount High School); Ruben Azevdo, Pierre de Coubertin (previously interim vp at Marymount Academy International); Véronique Carriére, John Paul I Junior High School (previously interim vp); and Alain Belair, Rosemount Technology Centre (on sabbatical last year). Mario Cardin and Daniel Hogue. 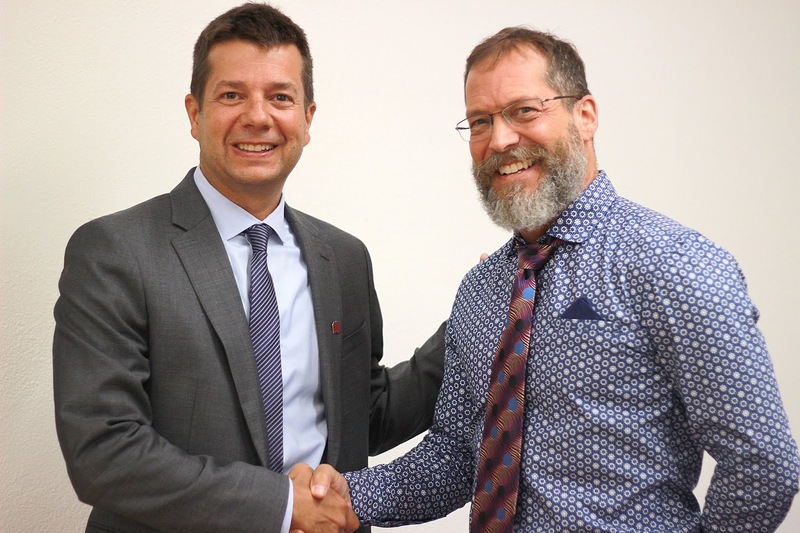 MATERIAL RESOURCES: Mario Cardin will succeed Daniel Hogue as director of Material Resources. new face this summer as Aaron Durocher joined the Student Services Department as the Spiritual and Community Animation Consultant, replacing Frank Lofeodo, who retired in June. A familiar face across the EMSB, Aaron spent the last six years as a Spiritual and Community Animator in a variety of schools, taking the lead on many dynamic projects. Prior to his tenure at the EMSB, he managed camp counselors at a summer camp as well as was a spiritual youth group coordinator for his faith community. Aaron holds a Master’s Degree in Teaching and Learning and a Bachelor of Arts in Sociology. ANTI-BULLYING WEEK: The Week Against Bullying and Violence in Schools will be marked October 1 to 5. Stay tuned for information on some programming. 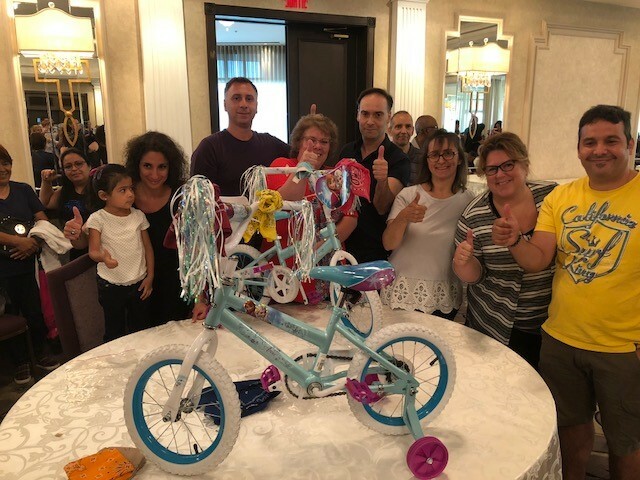 EMSB staff built bikes for needy youngsters. TEAM BUILDING: EMSB in-school and head office administrators gathered for a team building workshop before the start of classes. One of the activities was to work in groups and build bicycles. The bikes were then donated to children designated by the Sun Youth Organization. Very well received was the special guest speaker Dr. Ivan Joseph. Besides being a motivational speaker, he serves as Director of Athletics at Ryerson University in Toronto. 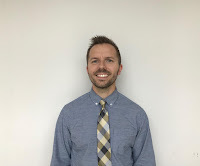 Before joining Ryerson, he was Director of Soccer Operations, Head Men's Soccer Coach and Assistant Professor, Health and Physical Education at Graceland University, a century-old liberal arts institution in Lamoni, Iowa. Born in Guyana, he grew up in Toronto where he was a nationally ranked high-school track and field athlete. He was recruited to Graceland as a student-athlete in 1993. CALENDAR: The EMSB wall calendars have been sent out to all schools and centres. MACKAY CENTRE: The new $21 million facility which will house the Mackay Centre and Philip E. Layton Schools on Terrebonne Avenue in NDG will welcome students during the first week of September. A formal opening will take place sometime after that. 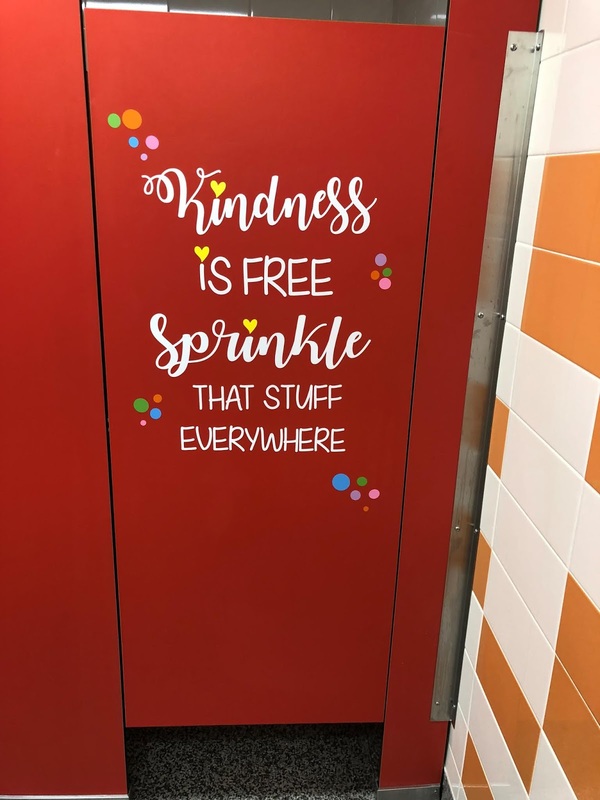 FACEBOOK: The EMSB Facebook page has become a hub of activity, keeping stakeholders apprised of all the fun and interesting events that take place in our schools. We actively engage with parents and students. Throughout the school year, we will use Facebook Live at some school events. When posting, everyone is encouraged to use the hashtag: #WeAreEnglishMTL. INSTAGRAM: Popular amongst students in elementary and high school, we are very active on Instagram, highlighting events through pictures, videos and stories on a daily basis. We encourage all schools in the youth sector to create an Instagram account. TWITTER: We use Twitter to disseminate breaking news, such as school closures and press releases. With the exception of news (late buses, parent information), we encourage all schools to migrate from Twitter to Instagram and Facebook. EMSB TV: In addition to our presence on social media, when appropriate, we highlight various events on EMSB TV, which is disseminated via YouTube. We actively encourage our schools to film and edit their own videos, which we will share on our networks as well. For major events, we will ask schools to choose a student to host the EMSB TV segment. This student will ask questions of guests and the segment will be edited by the school or the EMSB digital marketing team. BRIDGE PROGRAM: As a part of James Lyng High School's first ever summer mentorship program (The Bridge Program) that was facilitated by Farid Charles, in partnership with Montreal Community Cares and funded by RRM, seven students explored individualized programs focused on career paths and life skills. Three of the students chose to focus on photography. Throughout the course of the program they were mentored in photography by the very talented photographer Naskademini. The mentorship has culminated into the students' first, very own photo exhibit called If These Walls Could Talk taking place on August 30 from 6 pm to 9 pm at Espace Gris (5524 St-Patrick Street, Door C- Suite 210a). It is open to the public. Entrance is free and refreshments will be served. INCLEMENT WEATHER: Please note that we only announce school closures. These announcements are made via Twitter and Facebook. If schools remain open, which is often the case, there will be no announcement. MONTREAL FAMILIES EDUCATION FAIR: The EMSB and Inspirations Newspaper will have tables this year at the Montreal Families Education Fair on Sunday, September 23 (Noon to 4 pm) at the Holiday Inn - Pointe Claire (6700 Trans Canada Hwy) Pointe Claire. Admission is free. For more :http://www.montrealfamilies.ca/Montreal-Families/Education-Fair-Participants . TAKE IT TO THE MAT: Isabelle Dion from EMSB Human Resources will be taking part in “Take it to the Mat,” a fundraiser for the Lymphoma Society of Canada. "I decided to embark on a very special cause this year with the Lymphoma Society of Canada,"she said. "I am co-chairing the event with an amazing friend of mine who is battling this cancer. Today, there are 100,000 Canadians living with lymphoma. This is the fifth most common form of cancer in the nation; and there is no prevention, only hope for a cure. It is the leading cancer in teenagers and young adults (age 15-29 years-old) and the 3rd most common cancer in children." On Sunday, October 28, 2018, a host of experts in yoga and meditation, will join participants for an inspirational journey. Thanks to the generosity of take it to the mat sponsors, participants and donors, Lymphoma Canada is able to implement and support the following programs: Peer to Peer Mentoring: A program to connect patients and caregivers with those who have already been through the experience, Educational Forums: Keeping patients and their loved ones apprised of the most current information about lymphoma and National lymphoma treatment guidelines: for patients and doctors – developed by Canadian lymphoma experts, funded and spearheaded by Lymphoma Canada. This event is for anyone who would like to enhance their overall well-being through the benefits of yoga and meditation. 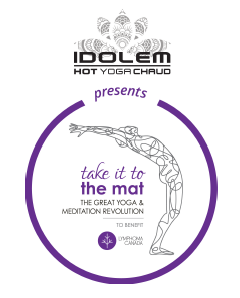 take it to the mat will be held at Agora de la danse from 9 a.m. to 2 p.m. "I would love for you to come and join me at this event which will incorporate the benefits of yoga, meditation and living a happier life," says Isabelle. For more information please go to: www.takeittothematmontreal.ca, or donate to a her team The Warriors. Should you want more information please do not hesitate to contact her at idion@emsb.qc.ca. Bruno Dodaro and Karina Awadalla welcome Rosemount High Principal Marco Gagliardi. PIUS GRAD LAUNCHES RESTAURANT: Karina Awadalla and Bruno Dodaro are a very nice young couple who recently decided to go into business together, opening Forketta Épicerie Gourmet at 3589 Beaubien Street East next to Rosemount High School/Rosemount Technology Centre. There is a small counter with stools, allowing you to eat inside or you can take out. Options for catering and a personal chef are already gaining attention in the neighbourhood. They also sell artisanal products which make for great personalized gifts. Bruno is a graduate of Vincent Massey Collegiate while Karina honed her fine cuisine skills at the St. Pius X Culinary Institute. Forketta was originally launched in April of 2016 as a home-based company creating beautiful catered dishes for events. Forketta has a creative menu of sandwiches, salads and desserts. They offer a variety of sandwiches, fresh salads of the day, ready-to-eat meals and a selection of homemade pastries. You can complete your combo sandwich with a choice of chip or muffin and drink or a daily salad and roasted potato and drink. Each of the sandwiches is named after different Montreal area neighbourhoods. See this full story on the place. 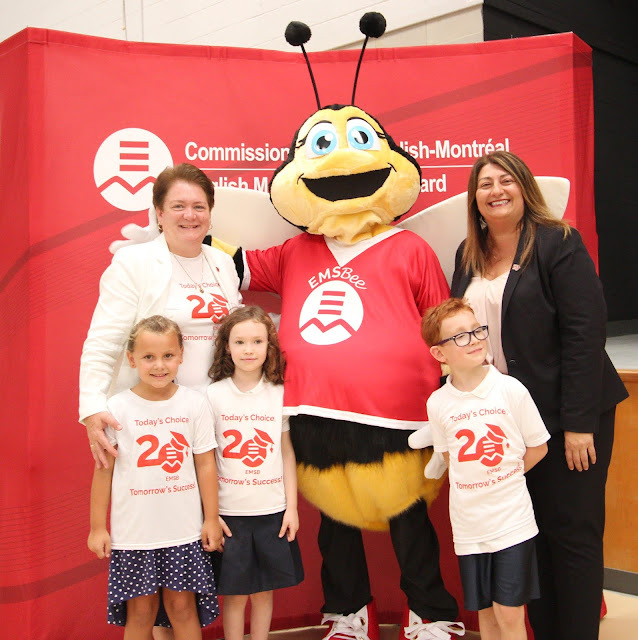 CÉLÉBRATIONS DU 20E ANNIVERSAIRE: La CSEM a souligné officiellement le 20e anniversaire de la création des commissions scolaires linguistiques au Québec lors de la première journée de classe de l’année scolaire 2018-2019 le 28 août, à l’école primaire Pierre Elliott Trudeau située au 6855, rue Cartier, à Rosemont. Cette dernière offre d’excellents programmes STIAM et de robotique. Anciennement connue sous le nom d’école primaire Francesca Cabrini, l’école a changé de nom afin d’honorer l’ex-premier ministre du Canada. Le robot Rebekka était de la fête et revêtait un t-shirt à l’effigie du 20e anniversaire. PREMIERS DIPLÔMÉS: On note parmi le personnel enseignant un certain nombre de diplômés issus de la toute première cohorte de finissants de la CSEM en 1998-1999. C’est notamment le cas de Jessica O’Meara, enseignante-ressource à l’école Pierre Elliott Trudeau. Elle a fréquenté l’école primaire Francesca Cabrini avant de s’inscrire au Collège Vincent Massey pour ensuite obtenir un diplôme en éducation inclusive de l’Université McGill. C’est une expérience inspirante que d’avoir le privilège d’enseigner à l’école même où elle a fait ses études primaires. EMSB EXPRESS: Le numéro d’automne de la publication EMSB Express vient d’être publié. Il renferme des sections portant sur le 20e anniversaire, la Soirée d’appréciation des parents bénévoles 2018 et dresse le portrait de l’école secondaire James Lyng. Matthew Guy, enseignant d’éducation physique et santé à l’école primaire Parkdale à Saint-Laurent, figure lui aussi parmi les premiers diplômés. Ses deux fils fréquentent l’école primaire Edward Murphy dans le quartier Hochelaga-Maisonneuve. Matthew Guy est à la une de l’EMSB Express. Voici le lien. 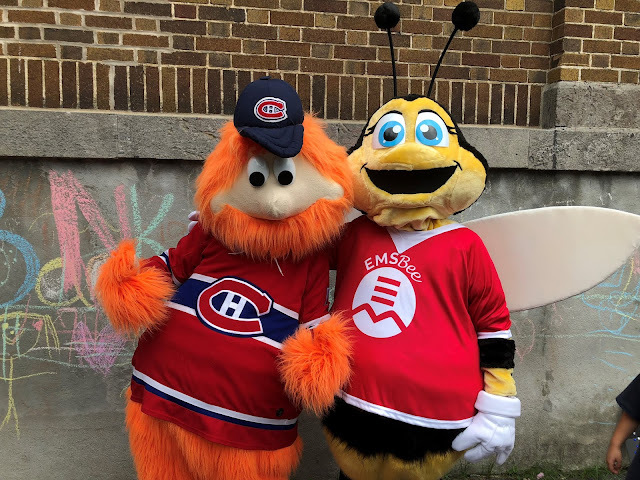 NOTRE MASCOTTE: La CSEM est fière de présenter Bumble Bee, sa toute première mascotte. Elle fera la tournée des écoles et prendra part à des événements spéciaux tout au long de l’année. Elle a fait ses débuts lors de la rentrée scolaire. SITE WEB ET PLUS ENCORE: Nous inaugurerons un tout nouveau site Web et les pages des écoles subiront bientôt elles aussi une métamorphose Tous les événements importants, telles la Foire des carrières, la Soirée d’appréciation des bénévoles et la Conférence annuelle pour les parents, graviteront autour d’un thème en lien avec le 20e anniversaire. Il en sera de même pour les écoles et les centres. 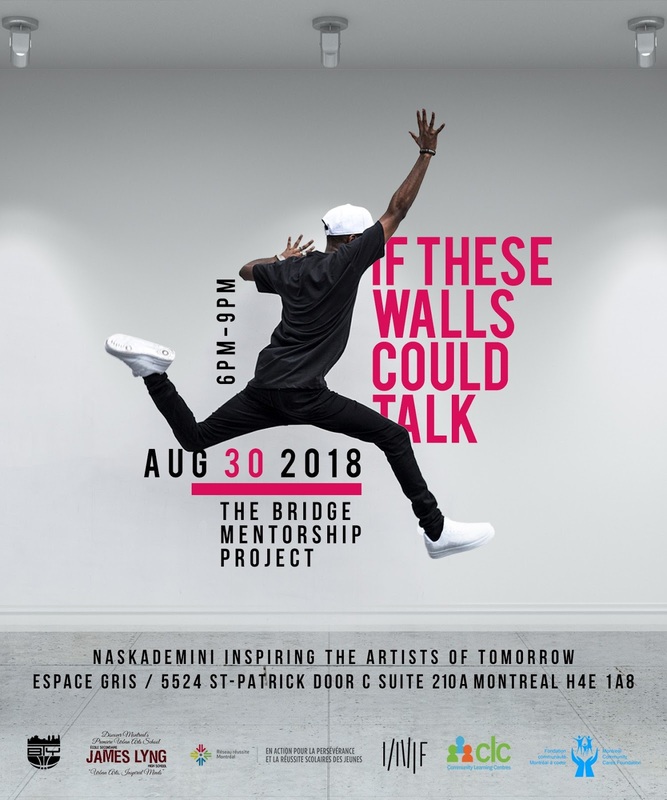 « À l’occasion du 20e anniversaire de la création par le gouvernement québécois des commissions scolaires publiques linguistiques en remplacement des commissions scolaires confessionnelles, tous ceux et celles qui sont liés de près ou de loin à la Commission scolaire English-Montréal ont de quoi être fiers », a déclaré la présidente de la CSEM Angela Mancini. D’AUTRES NOUVELLES AU SUJET DU SITE WEB: La CSEM procédera sous peu au lancement de son site Web entièrement revampé. Au cours des prochains 12 à 24 mois, nous procéderons également au transfert des sites de nos écoles primaires et secondaires sur la même plateforme que notre site phare, emsb.qc.ca. Au nombre des nombreux changements que nous prévoyons, mentionnons la conception de sites modernes et réactifs pour les ordinateurs de bureau et les appareils mobiles, un système de notification des urgences à la grandeur de la Commission ainsi que la capacité à partager aisément de l’information entre les sites. Grâce à un réseau de sites Web qui fonctionne comme un collectif, nous sommes à même d’encourager plus facilement le partage d’information avec nos partenaires en éducation, à savoir les parents, les municipalités, les universités, LEARN/CSC, le MEES ainsi que les organismes jeunesse locaux. Pour demeurer des leaders en matière d’éducation publique, nous devons faire en sorte que notre engagement envers les nouvelles technologies s’applique non seulement à nos élèves, mais tout aussi bien à l’ensemble de la communauté. LA PETITE HISTOIRE DE LA CSEM: Le 1er juillet 1998, la CSEM est née de la fusion des secteurs anglophones de l’ancienne Commission des écoles protestantes du Grand Montréal, de la Commission des écoles catholiques de Montréal, de la Commission scolaire Jérôme-Le-Royer et de la Commission scolaire Sainte-Croix. À l’époque, la nouvelle commission ainsi formée comptait plus de 25 000 élèves au secteur des jeunes et 12 000 au secteur des adultes. Deux ans plus tard, le nombre d’inscriptions aux niveaux primaire et secondaire surpassait les 27 000. Peu de temps après, le gouvernement québécois adoptait une mesure législative visant à renforcer la Loi 101. Ceci, conjugué à la situation démographique et à un taux de natalité plus faible, s’est traduit par une diminution constante de notre effectif scolaire. « Or, nous sommes heureux de constater que, depuis quelque temps, le vent commence à tourner », souligne madame Mancini. « Nous comptons désormais 19 561 élèves aux niveaux primaire et secondaire, soit une hausse de 267 inscriptions par rapport à l’an dernier. Lorsque nous publierons notre rapport d’inscriptions pour 2018-2019 plus tard cet automne, nous prévoyons des données encore plus élevées. Quant aux secteurs de l’éducation des adultes et de la formation professionnelle, on compte plus de 23 000 élèves inscrits, soit près du double du niveau enregistré lorsque la CSEM a été créée. Forte d’un effectif global dépassant les 42 000 élèves, la CSEM demeure la plus grande commission scolaire publique anglophone au Québec. La CSEM enregistre le taux de réussite le plus élevé, soit 88,6 %, parmi les commissions scolaires publiques anglophones à la grandeur de la province de Québec, basé sur une cohorte de sept ans. Ce résultat est d’autant plus remarquable que le taux de réussite provincial se situe à 80,1 %. FOIRE DES CARRIÈRES: La Foire des carrières 2018 de la CSEM se tiendra les 17 et 18 octobre au Centre professionnel St. Pius X à Ahuntsic. Les parents et élèves de la 4e et 5e secondaire sont conviés à une activité portes ouvertes le 17 octobre, de 18 h à 20 h. Ils pourront alors se renseigner sur les options offertes au cégep de même que sur les programmes de formation professionnelle. NOMINATIONS ADMINISTRATIVES: Deux directeurs, soit Michael Cristofaro (école secondaire Westmount) et Jacques Monfette (Centre d’éducation des adultes Wagar à Côte Saint-Luc), ont pris leur retraite. Ils sont remplacés respectivement par Robert DiMarco (auparavant à l’école primaire Westmount Park) et Nicholas Katalifos (auparavant à l’école primaire Roslyn à Westmount). Sandra Léveillé a été nommée directrice de l’Organisation scolaire. Elle sera remplacée à l’école primaire St. Dorothy par Denise Maroun, auparavant directrice de l’école primaire St. Monica à NDG. Voici d’autres nominations de directions pour l’année scolaire 2018-2019 : Marylene Perron, Westmount Park (auparavant directrice adjointe par intérim au Centre d’éducation des adultes John F. Kennedy à Saint-Michel et directrice à Parkdale); Joana Genovezos, Roslyn (auparavant directrice à l’école Coronation dans Côte-des-Neiges); Mike Talevi, Coronation (auparavant directeur à l’école primaire Dante à Saint-Léonard, il est présentement en congé et remplacé par intérim par Tanya Alvares qui était directrice adjointe à John Paul I, Pius X et directrice par intérim à Dante l’an dernier); Irini Margetis, Dante (directrice à l’école primaire St. Monica à NDG, était en congé l’an dernier); George Koutsoulis, école primaire Parkdale à Saint-Laurent (auparavant directeur par intérim); Silvana Crigna, St. Monica (auparavant directrice à l’école primaire Sinclair Laird dans Parc-Extension); Derrek Cauchi, Sinclair Laird (auparavant directeur de l’école secondaire James Lyng à Saint-Henri); Lino Buttino, James Lyng (auparavant directeur du Centre de formation professionnelle Laurier Macdonald); Rick David, High School of Montreal sur Le Plateau (auparavant directeur adjoint par intérim des SÉAFP); Darlene Kehyayan, Centre d’éducation des adultes James Lyng (occupait auparavant ce poste par intérim) et Anna Maria Borsellino, Centre de formation professionnelle Laurier Macdonald (auparavant directrice adjointe de l’Organisation scolaire). Les nouvelles nominations à titre de directeurs adjoints et directrices adjointes sont les suivantes : Réal Heppelle, FACE (auparavant directeur adjoint à l’école primaire East Hill à RDP); Jessica Monti, East Hill (auparavant enseignante à l’école secondaire Rosemont); Eugenia Carystios, Gardenview (auparavant directrice adjointe à l’école primaire Royal Vale à NDG); Maya Doughan, école primaire Honoré-Mercier à Saint-Léonard (auparavant enseignante à l’Académie internationale Marymount et directrice adjointe par intérim à l’école primaire Honoré-Mercier); Assunta Caruso, école secondaire Lester B. Pearson à Montréal-Nord (auparavant directrice adjointe à l’Académie Leonardo Da Vinci à RDP); Cynthia Canale, école secondaire Laurier Macdonald à Saint-Léonard (auparavant enseignante à cette école); Laura Fiumidinisi, Académie internationale Marymount à NDG (auparavant enseignante à l’école secondaire Rosemont); Christy Tannous, Académie Royal West à Montréal-Ouest (auparavant directrice adjointe à l’école primaire Pierre de Coubertin à Saint-Léonard); Vince Timpano, Collège Vincent Massey (auparavant directeur adjoint à l’école FACE au centre-ville); Matthew Shapiro, école secondaire Westmount (auparavant enseignant à l’école Focus); Cornelia Mandoiv, école secondaire Westmount (auparavant enseignante à Willingdon); Saverio Servello, Royal Vale (auparavant directeur adjoint au Centre de technologie Rosemont); Ivan Spilak, Académie Leonardo Da Vinci (auparavant enseignant au Collège Vincent Massey); Amanda Vallelunga, Michelangelo International (auparavant directrice adjointe à l’école secondaire Westmount); Ruben Azevdo, Pierre de Coubertin (auparavant directeur adjoint par intérim à l’Académie internationale Marymount); Véronique Carrière, école secondaire John Paul I – campus junior (auparavant directrice adjointe par intérim) et Alain Belair, Centre de technologie Rosemont (en congé sabbatique l’an dernier). RESSOURCES MATÉRIELLES: Mario Cardin succédera à Daniel Hogue en tant que directeur des ressources matérielles. SEMAINE CONTRE L’INTIMIDATION : La semaine contre l’intimidation et la violence dans les écoles se tiendra du 1er au 5 octobre. Restez à l’affût pour connaître la programmation des activités à venir. CALENDRIER: Le calendrier mural de la CSEM a été envoyé à toutes les écoles et tous les centres. CENTRE MACKAY: Les nouvelles installations au coût de 21 millions de dollars qui abriteront le Centre Mackay et l’école Philip E. Layton sur l’avenue Terrebonne à NDG ouvriront leurs portes aux élèves à compter de la première semaine de septembre. L’inauguration officielle aura lieu prochainement. MAUVAIS TEMPS: Veuillez prendre note que nous annonçons uniquement les fermetures d’écoles. Ces notifications de fermeture se font sur Twitter et Facebook. Si les écoles restent ouvertes, comme c’est bien souvent le cas, aucun message ne sera publié. The next Focus will be published on September 27. Submissions should be made to Michael J. Cohen preferably by e-mail (mcohen@emsb.qc.ca) by September 21 at Noon.